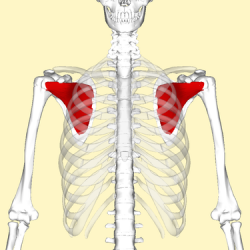 A large triangular-shaped muscle which fills the subscapular fossa.The term "subscapularis" means under (sub) the scapula (the wingbone). The subscapularis muscle originates there, beneath the scapula. Part of the Rotator Cuff muscle group the largest and strongest muscle in this group is the subscapularis muscle. . The subscapularis muscle is the most-used muscle in the shoulder. Subscapular fossa on the costal/anterior surface of the scapula. The fibres form a tendon which inserts into the lesser tuberosity of the humerus and the front of the shoulder joint capsule. Suprascapular Nerve, C5 & C6. Subscapularis is innervated by both the upper and lower subscapular nerves which come from the posterior cord of the brachial plexus.The upper subscapular nerve supplies the upper part of subscapularis, while the lower subscapular nerve branches into two, with one branch supplying the lower part of subscapularis. Contraction of the subscapularis can cause medial rotation and depression of the humerus at the glenuhumeral joint. In certain positions, it also helps produce extension and adduction of the shoulder joint. Arm position has a marked effect on the actions caused by this muscle: when the arm is raised, subscapularis pulls the humerus forward and downward; when the humerus is in a fixed position, subscapularis’ insertion can act as an origin and it producees abduction of the inferior border of the scapula. As part of the Rotator Cuff, Subscapularis plays an important role in stabilisation of the shoulder, and prevention of dislocation. It commonly helps produce medial/internal rotation of the shoulder joint. subscapularis can harbor up to three trigger points, with the two most common occurring near the outside edge of the muscle. Luckily, the trigger point on the inside edge of the muscle s much less common, because it is nearly impossible to contact by palpation and release manually.Referred pain from trigger points in the subscapularis muscle concentrates in the posterior shoulder region, with spillover into shoulder blade region and down the back of the upper arm. A unique “band” of referred pain around the wrist may occur as well. Typically the client is aware of this wrist pain, but does not think it is related to their shoulder pain. It is often injured by throwers.Tenderness and pain will be felt when pressing in on the tendon insertion on the inside of the upper arm.Subscapularis tendonitis symptoms include pain when moving the shoulder especially when the arm is raised above the shoulders. An overworked subscapularis muscle may make you feel like you are not able to lift your arm. It may be even responsible for your frozen shoulder. The lift-off test was originally described by Gerber and Krushell(199l) and is sometimes referred to as 'Gerber's Test'. The ability to actively lift the dorsum of the hand off the back constitutes a normal lift-off test. Inability to move the dorsum off the back constitutes an abnormal lift-off test and indicates subscapularis rupture or dysfunction. Feel it contracting, then release the tension and start to massage it. Make sure you only massage the muscle and not your nerves. Otherwise you are likely to end up with some pain for quite a few days because you stressed the nerves in your armpit instead of the muscle. For massaging the subscapularis muscle use thumb technique. Performing isometric exercises that target the subscapularis involves contracting the muscle for five to 10 seconds at a time without moving your shoulder joint considerably. Start position: Stand with your knees slightly bent and feet in a split stance. Hold the elastic tubing at shoulder height with elbow out to your side and slightly bent. Action: Against the resistance, bring your hand across and in front of you until you touch the front of your opposite hip. Return to the starting position. Key points: You should rotate gradually through your shoulder as you bring your hand across your body. 3. Perform the side-lying internal rotation exercise with a dumbbell while lying on a flat bench or table. Start with the dumbbell in your left hand and lie on your left side with your elbow tucked into the left side of your abdomen and your forearm pointed forward, extended over the edge of the bench. Lift the weight until your forearm touches your belly, then lower it slowly and repeat. Complete at least eight repetitions, then turn over and switch arms.